Mike’s Custom Flooring supplies a wide range of hardwood flooring services to the commercial and residential locals of Eastern Panhandle of Berkeley and Jefferson Counties in West Virginia as well as Frederick, Loudoun and Fairfax Counties in Virginia. We carry all necessary credentials to vouch for our professional authenticity including license and insurance coverage. With the aid of high-end products, equipment, tools, and supplies exclusively offered to licensed professionals, our technician’s expertise and skills ensure premium results. 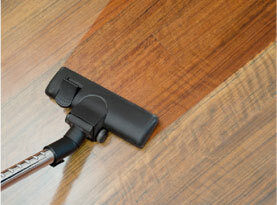 With Mike’s Custom Flooring you can expect superior workmanship, high morals and friendly customer service. Along with our various hardwood floor services, Mike’s Custom Flooring includes hardwood floor consultations to our commercial and residential customers. With this particular service, we can discuss which type of wood floors are more optimal for commercial building or residential dwellings. We consider desired finishes, stain colors and applications regarding installation as well as answer any questions you have. – Hardwood Floors. Hardwood flooring is a coveted flooring service that suggests luxury and beauty, though more often than not it is fairly affordable. Ideal for allergy sufferers, as carpeted floors tend to get a buildup of allergens, hardwood floors are easily cared for by diligent owners, and can last for decades if properly maintained. 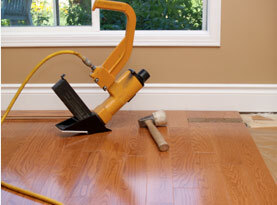 – Engineered Hardwood Flooring. Engineered wood is a great substitute for solid hardwood in damp or dry areas as it is less affected by the heat or humidity. 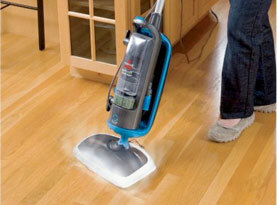 Simple installation can be applied on nearly any subfloor. – Solid Hardwood Floors. Solid Hardwood floors offer a natural beauty over the years as the years pass, harnessing a well kept solid hardwood floor can be enhanced with the aged look. 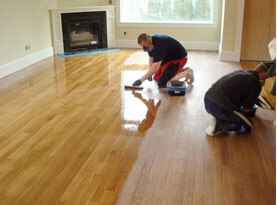 Has the ability to be refinished or stained. – Wide Plank Hardwood Flooring. Wide plank hardwood flooring breaks away from the overly common strip flooring options to deliver a classic craftsmanship. It is a high quality product offering sturdiness and durability. – Hand-Scraped Hardwood Floors. The hand-scraped surface texture of hardwood flooring appeals to the rustic look. Celebrating the trees imperfections, hand-scraped hardwood floors emphasize the unique graining and natural characteristics of the knots and markers. With literally over hundreds of coloring options, hardwood floor colors can range from light to dark with remarkable hues that attract anyone and everyone. Mike’s Custom Flooring experts can provide you with samples of the many colors hardwood floors we have to offer. Mike’s Custom Flooring hardwood floor selection guide supplies you with the many possibilities hardwood floors have to offer the businesses and homes across Eastern Panhandle of Berkeley and Jefferson Counties in West Virginia along with Frederick, Loudoun and Fairfax Counties in Virginia. It can be an overwhelming choice but with our expertise and understanding of the qualities you most desire, we can help you narrow down the options. With the varied types of hardwood floors, choosing the right finish, and the perfect color, Mike’s Custom Flooring can help you make the right decision in finding the hardwood floor the fits your tastes, the composition of the room, the best color, the right materials, and the maintenance involved as well as your budget. Call us today to get started!